How To Pair My Phone to a Bluethooth Device. Bluetooth technology is creeping into more devices and allows us to get more out of our phones. Whether it’s using a Bluetooth headset for hands free mobile calls, connecting to your cars media system, streaming music to a potable Bluetooth speaker or connecting your phone to a smartwatch you will probably need to get the two devices talking to each other before you can make use of their features. In order to connect or pair the devices you first need to check that it’s supported. There are many devices that have Bluetooth but not all will be supported by your phone. For example an iPhone may recognize a Bluetooth keyboard or printer but it won’t be able to pair with them to allow typing or printing, so the first step it to always check the device is supported before you try to connect (pair) it with your phone. Also ensure you turn on the device, no matter what it is you won’t be able to connect to it if it has no power. You will also need to enable the discovery mode on the device. This is normally done by holding the power button but its best to check the manual first then follow the steps below. Go to home, then the menus view or use the swipe down action to bring this view up. Click the settings option, (normally seen as a little cog). 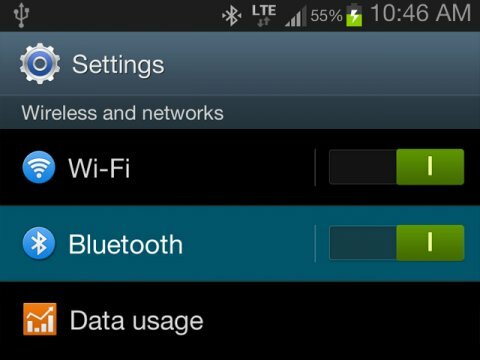 Under the wireless and networks menu header find Bluetooth. Select the Bluetooth box to turn on enabling. Make sure the headphone speaker or other device you wish to pair to your phone is powered on and its Bluetooth setting is enabled. Once the Bluetooth option is enabled select the Scan option on your phone. Wait for the name of your Bluetooth headset or other device to appear on your phone, then tap this name. If the Phone doesn’t automatically pair with the device it may ask for a pass code. Enter the pass code provided with the device. 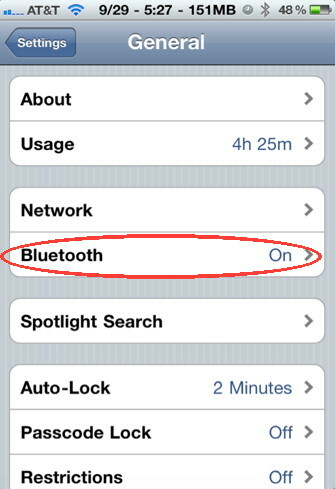 Go into Settings, General, Bluetooth, and set Bluetooth to ON. If you have the iPhone Bluetooth headset; connect the iPhone Dual Dock or the Bluetooth travel cable via the USB port on your computer. This process automatically pairs the Bluetooth device with the iPhone. For third-party headsets or other devices, first ensure that it’s compatible with the iPhone. Browse to Settings, General, Bluetooth. Follow the instructions included with the headset to put it into discoverable mode (this usually involves holding down the power button for a few seconds). The headset should soon appear in the list of devices on the iPhone; select it to pair it with the iPhone. If the iPhone asks for a security code, enter 0000 and select Connect. Try entering 9999 or 1111–two other common security codes–if 0000 doesn’t work or check the manual for the device as this should have the security code.